I have always considered myself a good pugilist in my day. I am proud to say that I dodged when I should have and my defense was second to none. But I will also say that I never had that killer instinct that you need when battling a formidable foe. Maybe I needed a better trainer. Maybe I needed someone who could show me how to fight. Maybe I needed Marty. A 67 year old fighter who has had more emotional spikes than the great majority of us will, or could, ever endure. To begin with, at age 44, she was separated from her husband but found emotional stability with her 15 year old son. Although anxiety was a daily curse now because of her new, single motherhood, Marty was blessed that her boy was coping better than she was at times. Shortly after this breakup, she was diagnosed with beast cancer. Because of the immense mental and physical difficulties associated with this disease, Marty wanted to give her marriage one more go. Radiation and a partial mastectomy were successfully performed, but regrettably, her marriage was not as successful and she found herself a single parent once again. For the next few months, being a single mother was starting to ease its financial and emotional grip, with the fear of cancer on the back burner, behind her son. Then one day, she felt that grasp, pulling her back into those yesterdays of fear and uncertainty. Marty was diagnosed, again, with breast cancer. This time, she decided her treatment would be fast and furious. Enough so that this bothersome bandit had no where to hide. Radiation, chemotherapy and another partial mastectomy would surely loosen that recurring hold. By 1994, it was agreed between Marty and her physician that she was cancer free. Even with 2 partial mastectomies, she had been given a reprieve and found herself doting on her son and looking for another love. A couple of different men entered her life, but for reasons that partly involved the results of her cancer bouts, Marty and her new beaus just couldn't make it work. It truly does take a special man to stumble along with a woman, yet make sure she doesn't fall. A man that wouldn't judge her for the physical wounds but how she tried to heal from the fight. . Her high school reunion was in 2005 and boy did she have stories of victories to tell. While enjoying seeing her graduating class again, someone from her earlier life remembered her vividly. His name was Phil and his memories of Marty stretched back to Junior High. They spent a great deal of time talking, reminiscing and she simply loved the feeling of smiling. She remembers in short, "We danced.....and he felt good". Although something sparked, it would not be for another four years that they would reconnect. Marty recalls that on August 31, her phone rang and yup, it was him. "We talked for hours! Such joy for us. He came to see me in Pittsburgh for my birthday on October 1, then I visited him in Florida, where I always wanted to be. We were falling in love." Sweet love, unfortunately at times, needs to be proven. Would Phil stick around if Marty was ever diagnosed again? Did he have the fortitude to cope with his new, sweet love if cancer ever returned? Could he accept her with some physical anomalies that would only be visible if intimacy evolved? Does he know a woman is more than each part separately? Or can he truly see the sum of all parts? In essence, can he love? Truly love? October, 2010. Marty was selling her home and getting ready to move to Florida to be with Phil and hopefully answer these questions. But cancer returned, lung cancer. With a renewed vigor, she vowed to take care of it as quickly as possible, and with her new-found support, no matter how far away he was, she was on the plane. "My dream! ", she recalls. "I got a condo on the the beach, on the sand for a year! Oh what fun! I spent the weekends with Phil. After a year, he asked me to move in with him. So I did!.....happy girl! " End of story. Life was good, wedded bliss soon to follow and the beach as the backdrop for the rest of her life.........until Valentines Day, 2014. Unbelievably, Marty found another lump in her breast yet again. "After all my history, my surgeon advised a double mastectomy.....so I did it without reconstruction". She goes on to explain...."radiation affects skin so it looses it's elasticity. Dear Phil took wonderful care of me..so much love!". By January, this once in a lifetime man married her. "He is amazing. I survived 4 cancers, 3 breast. I amaze myself." Marty's granddaughter, Toren, was her flower girl and with all the strength she amassed through her own ordeals, it was the tender innocence of Toren that showed her weak side. Toren was diagnosed with leukemia. "Her beautiful blond hair.....she never left my side." Toren will be continuing with chemotherapy until December, 2015. Although her immune system is suppressed for the time being, she is full of sprite, as are all children her age. She is full of love, as all around her are and Toren is full of hope, as we all should be. Marty has found her niche, now, in life by supporting, and believing, in alternative medicine through acupuncture and essential oils being a distributor with http://www.youngliving.com/en_US/. "So now I am again cancer free...I am currently making my own organic deodorant and body care products...my contribution!" That was a quote attributed to Brendan Behan, a well-"versed' Irish poet, novelist and playwright, which plays right into this post. Now that times have changed, St. Patrick's Day has many declaring their ancestry as Irish, regardless if their name is Baryshnikov, St. Pierre or Polanski. 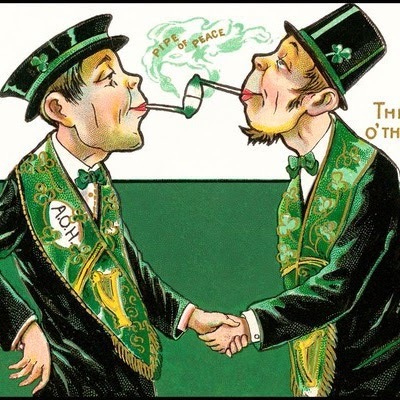 In fact, more than 30 % declare themselves of Irish ancestry in the days leading up to St. Patrick's Day and when the same poll is taken 30 days afterward, only 16 % say they are of Irish stock. Many seek any reason, really, to indulge in original Irish liquor on just one day of the year. 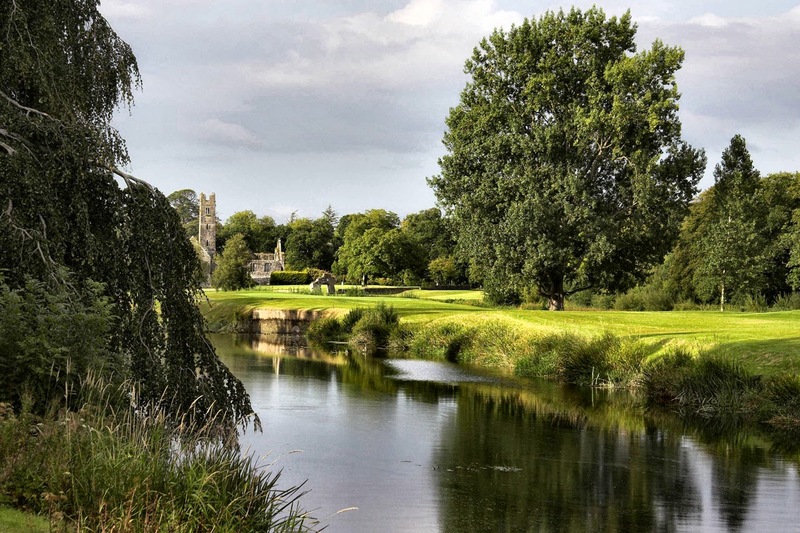 And Ireland is known for the superior spirits that are enjoyable straight from the bottle or mingling with other ingredients to result in a tasty treat, even if you aren't a drinker. Ireland is much like New England. Not only does liquor bring the worst out in people, but to most of the Irish, it enhances togetherness and warmth, much like rum's effect on our fore-families. Their meals are simple and inexpensive yet provide the comfort feeling we Yankees are known for. Let me give you just a few examples of this simplicity, but with a New England influence. 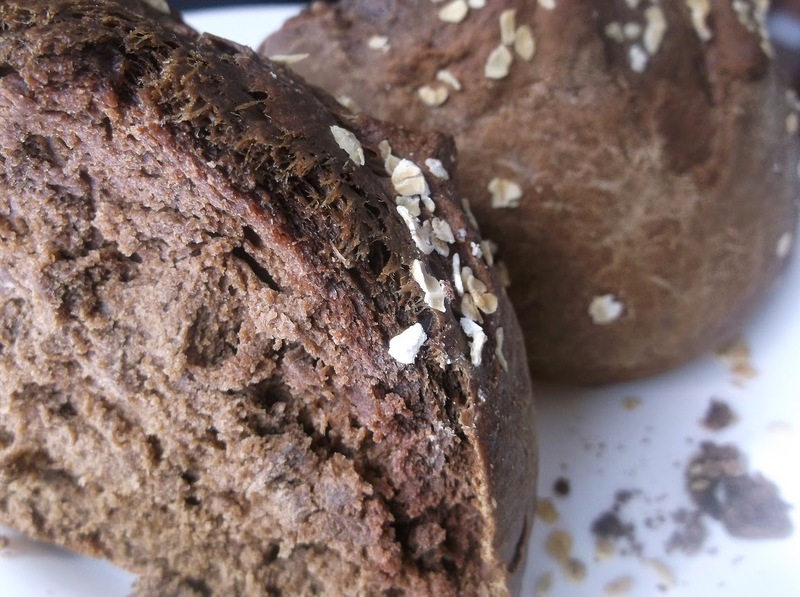 Maslin literally means brass, but it also refers to a variety of grains used in the baking of bread. So keeping with tradition, in a way, I am including different grains as well as a surprise ingredient that I think you will find a perfect fit. If you don't have buttermilk on hand or just don't want to purchase it, the perfect substitute is mixing 1 tablespoon vinegar or lemon juice in the same amount of whole milk and let it sit for 30 minutes, or even longer. It will curdle, which is exactly what you want. The interaction of this with baking soda gives this perfectly salty/sweet bread that distinctive hollow sound and the flavor is will remind you of an old world bake shop, in Ireland of course. Preheat oven to 375-degrees F and position oven rack to the upper portion of the oven Grease a baking pan with nonstick cooking spray. In a large bowl, combine both flours, graham crackers, baking soda and salt. Add butter and cut in using either 2 knives, scissor fashion or a fork. Stir in buttermilk, honey and egg, mixing well. Turn out onto well floured work surface and knead for a minute, or until smooth and elastic. Brush off excess flour and place in the middle of the prepared pan. 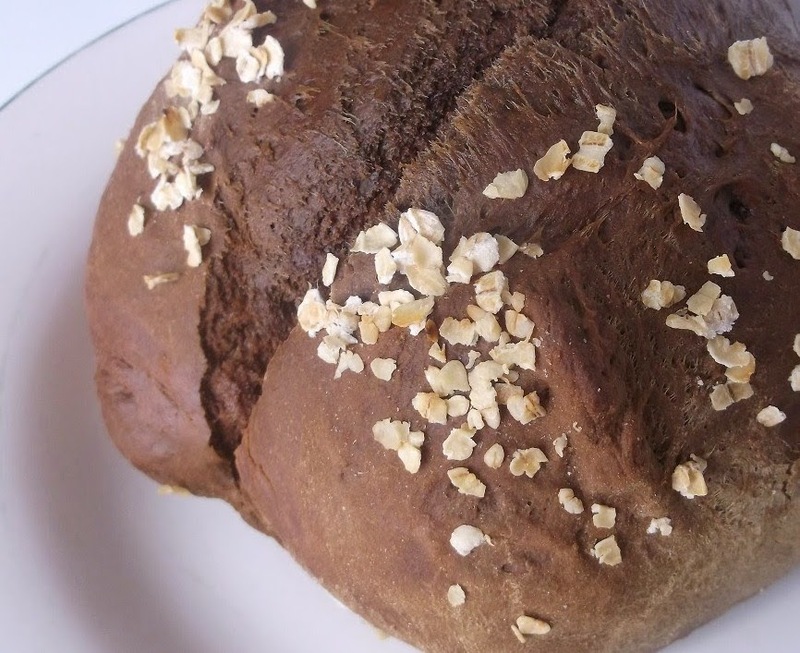 Brush the top with honey and sprinkle extra rolled oats over the top, slightly pressing into the dough. Mark the top with a serrated knife with two 1-inch deep gashes. Bake 40-45 minutes, or until very well browned all over. Remove to cool slightly before serving. * Simply place the oats in a blender or food processor and have at it. In a few seconds on high and you will have powdered rolled oats, or oat flour. Yankee because of the sweet/tangy addition of dried cranberries and Soda because of the soda used........just kidding. 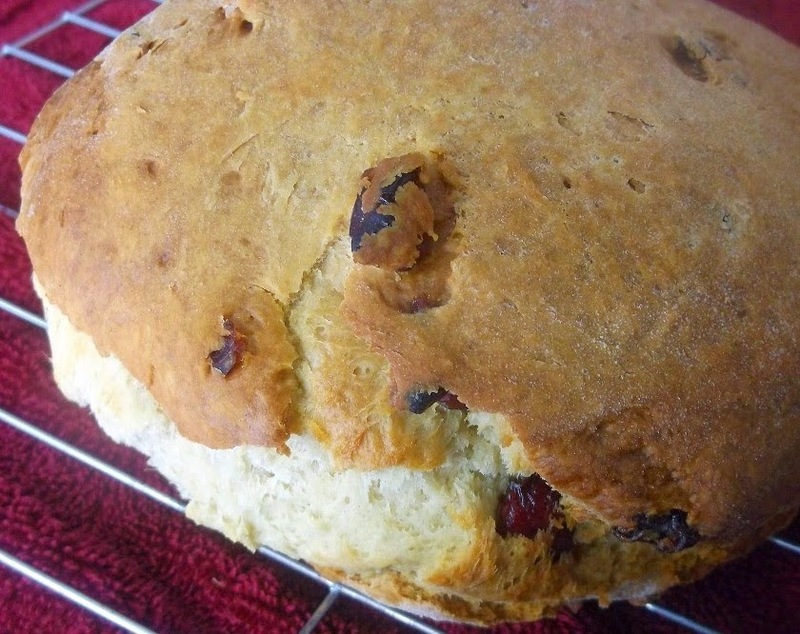 This is called soda bread because of the chemical reaction of baking soda with buttermilk. It gives you the perfect rise and density found in old world-style breads while the crispy browned exterior is ideal for breaking open to enjoy. Preheat oven to 375-degrees F and position oven rack to the upper portion of the oven. Grease a baking pan with nonstick cooking spray. In a large bowl, combine flour, sugar, baking soda and salt. Cut in butter with two knives, scissor fashion or use a fork. 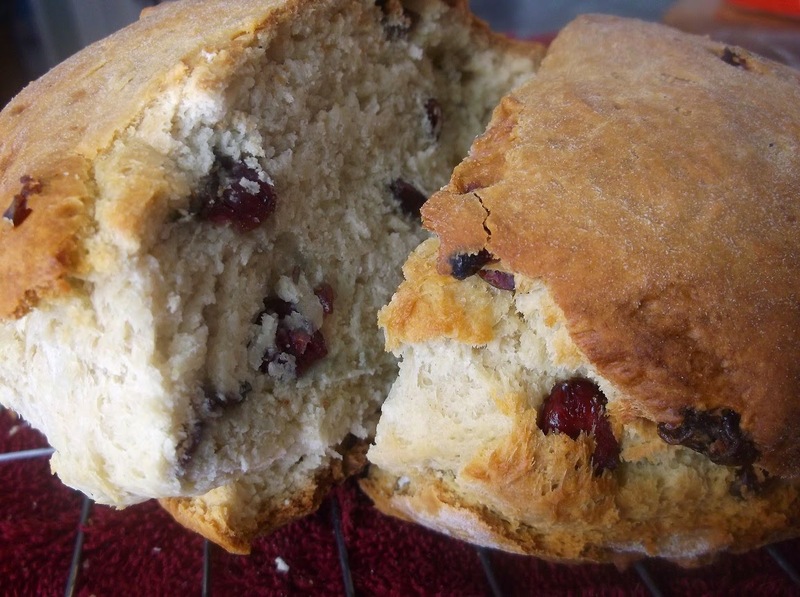 Add the buttermilk, egg, cranberries and caraway seeds, mixing well to form a dough. Turn out onto well floured work surface and knead for a minute or so, until smooth and elastic. Form into a round loaf, brush off excess flour. Place in middle of prepared pan and spray the top with nonstick cooking spray. Bake for 40-45 minutes, or until well browned all around. Remove from oven to cool slightly before tearing into. Yes, I already know. There is no such thing as Bailey's Irish Whiskey. This beautifully scented, Irish cake is, however, brought to you by a Bailey and has a hint of Irish Whiskey both in the cake and on 'top'. You can, however, substitute a few drops of rum extract in the milk below or just leave out any hint of alcohol, and its' taste, altogether. 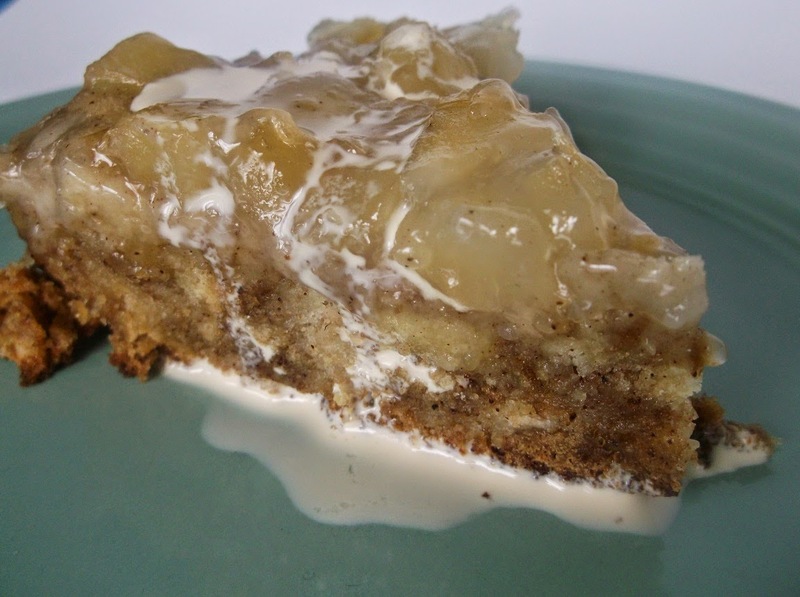 The curdled milk is a great way of adding buttermilk flavor without the added expense while giving this upside down cake perfect flavor and moistness. In a small bowl, whisk together milk, 1/4 cup whiskey and lemon juice and let sit 30 minutes to curdle while preparing rest of recipe. Melt 4 tablespoons butter in a 9-inch round cake pan over low heat. Using a wooden spoon, stir in the brown sugar and cook, stirring for about 3 minutes until smooth and bubbling. Remove pan from heat. Lay the apple slices on top of melted butter/brown sugar mixture decoratively. Sprinkle the dried cranberries over the top and evenly drizzle remainder of whiskey; set aside. In a bowl, whisk together flour, baking powder and ground ginger. In another bowl, beat remainder of butter and sugar on high until light and fluffy. Scrape down sides and add eggs; beating very well. Reduce speed to low and beat in the flour, a little at a time. Beat in the milk mixture just until moistened. Spoon batter over apples and even out top without disturbing the apple arrangement. Bake 35-40 minutes, or until toothpick inserted in middle come out clean. Cool cake in the pan for a couple of minutes and then run a knife around the edge of the pan to help release. Invert onto a serving platter or plate quickly and carefully. Serve warm or at room temperature. This bread pudding is anything but typical. It is beautifully sweetened, less dense and 'gummy' than many other equivalent puddings and the sweet, caramelized crust that forms makes you want to just pick it off first then eat the rest later. Use whatever muffin you desire, I just happened to adore cinnamon but regardless of what you choose, make sure you have 5 cups total after cutting. Taitneamh a bhaint as! Slice muffins horizontally about 1-inch thick. Butter all cut sides and grill over medium heat until well browned, about 2 minutes per side. Place on a plate and let cool in refrigerator for an hour, preferably overnight. Meanwhile, add 2/3 of the diced apple to a saucepan along with apple juice or water and maple syrup. Bring to a boil over medium heat, stir, reduce to low and simmer 6-8 minutes, or until it has thickened and apples are done, but still firm. Remove from heat and set aside. Spray a 9-10-inch cake pan with nonstick cooking spray liberally; set aside. Preheat oven to 350-degrees F.
Cut grilled muffins into cubes and add to a bowl along with remainder of diced apple. In another bowl, whisk together milk, eggs, brown sugar, cinnamon, vanilla, juice and grated rind and ginger. Pour over muffin cubes and gently toss to evenly coat. Transfer to prepared cake pan, evening out the top. Spoon cooked apple mixture over the top evenly and bake 40-45 minutes, or until it is firm when touched in the center with a spoon or fork. Make Irish Butterscotch Cream while pudding is baking. Remove pudding to cool slightly before running a dull knife around the edge to loosen. Cut into wedges and serve drizzled with Irish Butterscotch Cream. Put 1 cup whole milk, light or half-and-half cream in a saucepan with 2 tablespoons butter or margarine, 2 tablespoons each of brown sugar and Bailey's Irish Cream and 2 teaspoons honey or corn syrup. Over low heat, bring to a simmer while stirring frequently to prevent scorching. After 2-3 minutes, it will be thicker and creamier, stir in 1 teaspoon vanilla and remove from heat. Simple? Yes! Traditional? Yes! But don't let this seemingly mundane dish prevent you from make it. There are so many things I could do to this dish to keep those "food snobs" at bay, but why play with a recipe that has been enjoyed for so long in Ireland? Us Yankees have been enjoying this dish for just as long, but called Scootin' 'Long the Shore. And as much as I would like to add this and that to our version, I decided to take the critics blows for offering a "dull and idiot simple" New England classic. My response to them? You really don't want to know! Heat a large oven-safe skillet over medium heat. Add and cook bacon until crisp or to your liking. Remove bacon to crumble and add back into the skillet with onion and cook an additional 5-6 minutes, or until onion is soft but not browned. Drain fat and add potatoes and broth. Stir to combine, bring to a boil and cover. Reduce heat to low and simmer 8-10 minutes(according to the size of your potato cubes), or until the potatoes are firm, but tender and the liquid has absorbed. If you still have liquid after potatoes are done, simple increase heat to medium and continue cooking, uncovered, for a few more minutes until it has evaporated and/or absorbed. Preheat broiler and place oven rack at least 3-inches from heat source. 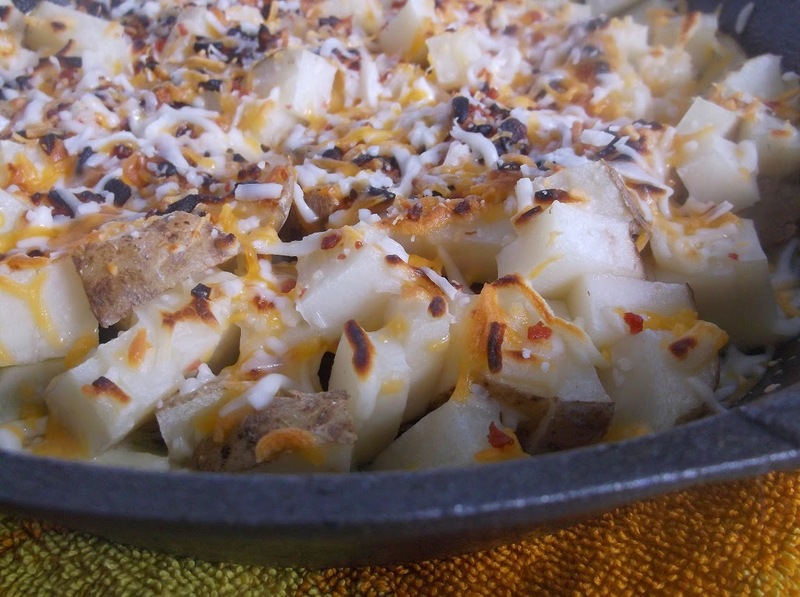 Remove skillet from burner, evenly sprinkle cheese over the top and broil until as crisp as you like. Remove to serve immediately. Top with sour cream if desired. I remember once, many years ago, trying a Tipperary Pippin Apple and was blown away at the perfect cooking nature of it. Of course, now there are so many more to choose from but that one taste has stayed with me all these years. 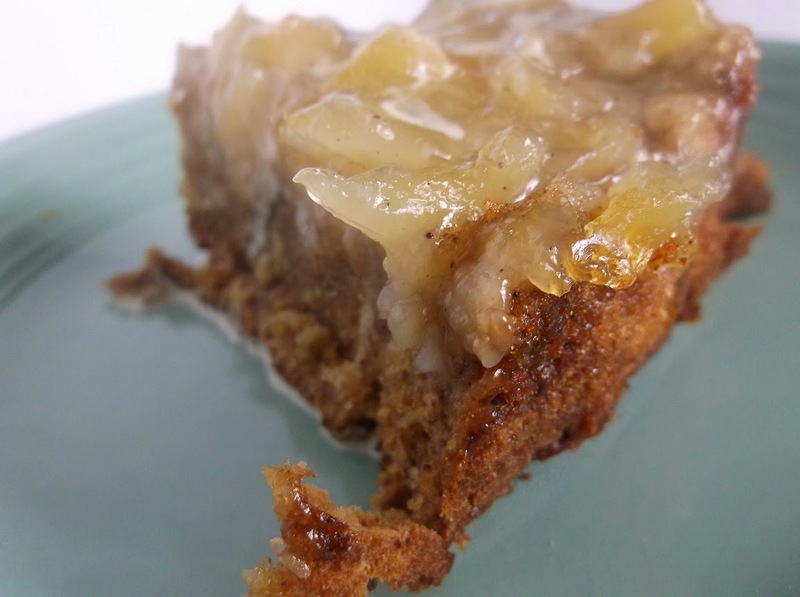 So in honor of my first bite of a true Irish apple, enjoy this Yankee take on the Apple Barley Pudding that is so dear to Irish hearts, and palates. I gave this a little zing that I think is spot on. For an even warmer feel, try substituting allspice for the nutmeg. Now many of you will be asking by now, why barley in a dessert? Many centuries ago, in Ireland, barley was a cereal grain that was widely used in kitchens during St. Patrick's time, which is only summized as being in the 5th century. So barley was used as a thickener, porridge, breads, pastries and, of course through natural progression, desserts of all kinds. In a large saucepan, bring the apples, barley, water and apple juice to a boil over medium-high heat. Reduce heat to medium-low, cover and simmer for 20-25 minutes, or until barley is soft. Remove from heat and strain, reserving any liquid. Add to a food processor bowl, or in batches using a blender and puree until it resembles chunky applesauce. Add liquid if needed to puree or more apple juice if the liquid has been fully absorbed. Transfer mixture to a large bowl and add sugar and spices, mixing well. Cover and refrigerate until cooled or serve warm. Meanwhile, make cranberry "sauce". In a small saucepan, add cranberries and juice. Bring to a boil over medium,-high heat. When boiling, reduce heat to low and simmer 10 minutes, or until cranberries have started to take in the juice and swell. Transfer to a blender or food processor and puree until smooth. This sauce will thicken perfectly while pureeing because of the very high, natural pectin levels in the cranberries. Pour into a bowl and refrigerate until cooled. 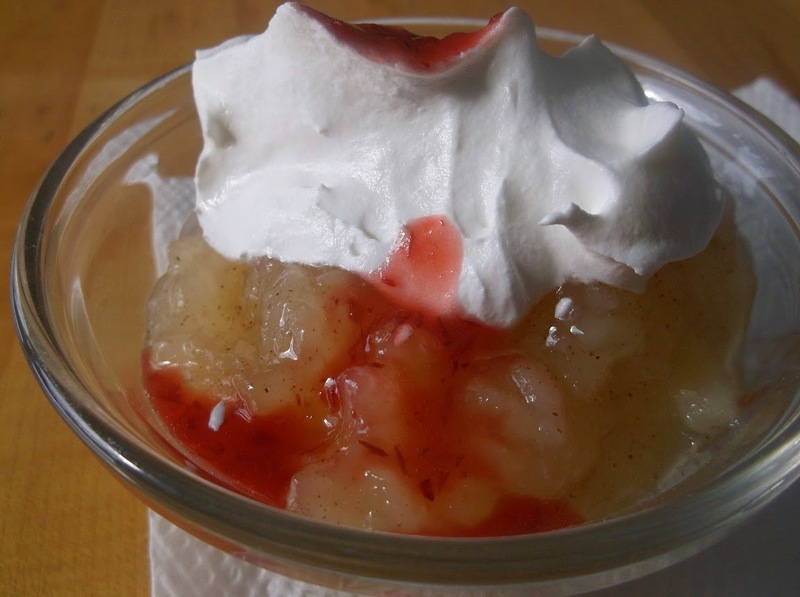 To serve, spoon apple pudding into 3-4 serving dishes, top with whipped topping and drizzle sauce over the top. Pearl barley has been processed, therefore it is not classified as a whole grain. But if you would like to add hulled barley(aka pot barley or barley groats) in order to obtain the fiber, simply cook twice as long, and you will need to add one extra cup of liquid because of the longer cooking time. The consistency will not be altered because of the addition of other ingredients, but if you were to cook it on its' own, it will be much chewier and sticky. And don't forget to rinse it before cooking to help keep that stickiness down. Fate can be serendipitous and adverse, or both. Imagine this. A typical mother of two beautiful daughters and an extraordinary son, Bonnie's life was simply ordinary, yet soon to become exceptional. 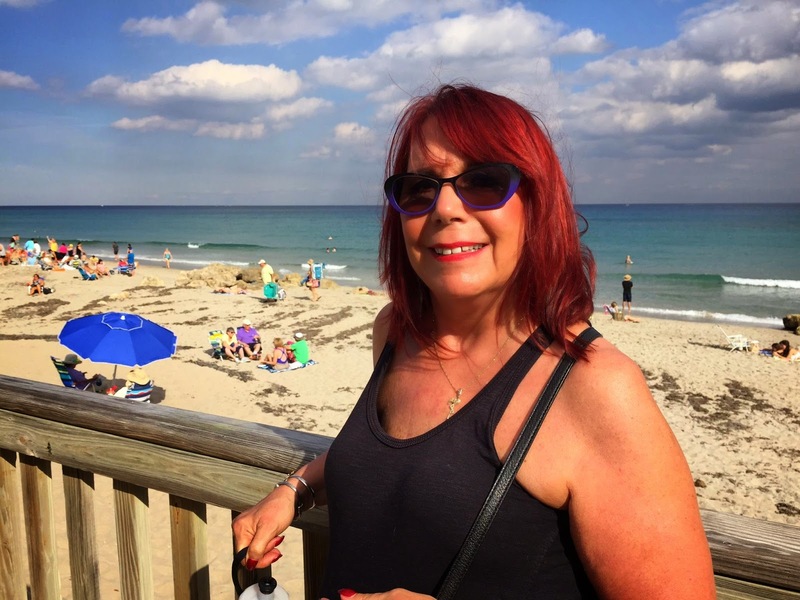 Although her mother was diagnosed with bilateral breast cancer at the age of 69, she herself had no symptoms nor signs of any such disposition, although the thought of genetics was constantly running amok in her mind. But being a single parent for 17 years in 1992 Ohio, there were present and 'real' parenting issues to attend to, not to mention that sweet reverie of a nice gentleman walking that 'yellow brick road'.....right to her doorstep. At 44 years of age, she found Larry walking that road, dazzling her with sunshine and filling her heart with honest, contented and supportive love that would prove itself over and over again. Agog with new-found adoration from him and lasting affection from her family, fate would show one face that would be tested 7 weeks later. Bonnie would understand the innate fear her mother endured when she, herself, was diagnosed with breast cancer. Without apprehension, she had a lumpectomy and an axillary dissection, a standard procedure to examine and remove lymph nodes. "I had the best support system with my children, mom, sister and Larry." With this formidable support system, her mind became eased and her life became enriched. It wasn't long before Bonnie found Larry on bended knee and her son, Matt also became engaged. "BUT, in September 1994, I had my 6 month mammogram and a lump was found. 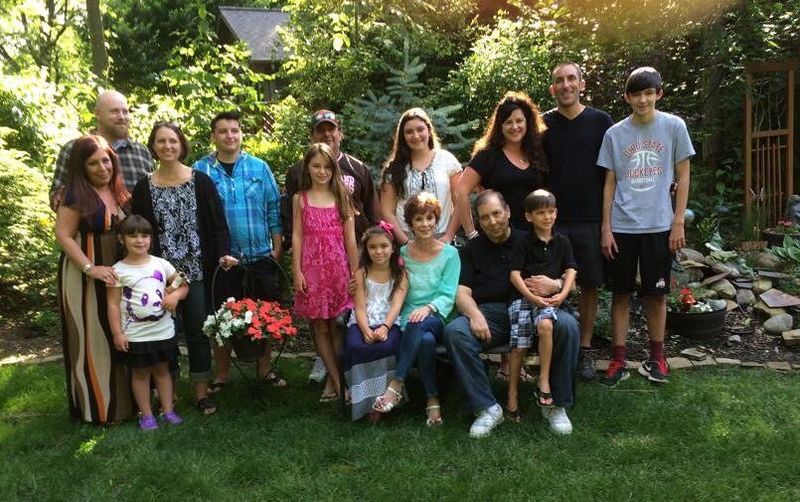 Two days later, a biopsy showed cancer again, second primary, no metastasis." Bonnie continues, "I was devastated and frightened. I got several opinions and after discussions with my family and Larry, I chose to have a bilateral total mastectomy with no reconstruction. This was the right decision for me. Larry had said I was more than the sum of my breasts. " With fortitude that obviously matched Bonnie's, Larry fulfilled his connubial commitment and married Bonnie on Valentines Day, 1995. In 2004, knowing the high risk of cancer from her mother and grandmother, Bonnie's eldest daughter Jill opted to take the bold, and unselfish, step to reduce her chance of breast cancer by 90 % by having both of her breasts removed, even without initially testing positive AND with a new man in her life. After making this decision, she had an ultrasound and mammogram done, both of which were negative. One last test was done, an MRI. And wouldn't you know it, breast cancer was discovered. Talk about yet another face of fate! By April, 2009, Jill's surgeon informed her that her ovaries would need to be removed because of the likelihood of ovarian cancer, directly attributed to her breast cancer. "Jill fought this and, because she didn't have the gene, so she felt safe. The doctor won and the ovaries were removed. The final pathology showed stage one ovarian cancer. This doctor had saved her life." A hysterectomy was soon to follow for other medical reasons. A shout out must go to Chris, Jill's husband. Not only was he a true advocate for his wife, but for he entire family as well. He played as much of a deciding factor in the quality of Jill's life as any doctor could. Enough is enough, wouldn't you think? "In August of 2009, my daughter Tricia, age 40, decided to have a prophylactic double mastectomy. A mammogram and ultrasound were negative, but an MRI showed a suspicious area. When a biopsy was performed, it showed breast cancer. Tricia had a double mastectomy and had her ovaries out." If there was ever such a family that deserves a tribute, it would be this steadfast family. I am in a haze of reverential wonderment for these brave women and the men who stood by them. To Bonnie's son, Matthew, and Larry, we salute and praise you for supporting all the loved ones around you who were struggling. To Bonnie, Jill and Tricia, we celebrate with you. There can be no more of a fitting epilogue to the struggles this entire family than to quote Bonnie in her correspondence with The Yankee Chef. "My daughters and I feel blessed in many ways. Surround yourself with good and loving people. Appreciate everything. Hug your kids and your husband, yell less often, tell those you love that you love them. Every day I am reminded of two things when I look in the mirror. I am a woman without breasts , but more importantly I am a woman who survived breast cancer.....We are survivors. We want you all to be survivors. Know your bodies. Be pro-active. Ask questions. Be your own advocate. We feel blessed to have each day and each other and all of you".